Plano, TX April 16, 2012 -- David Allen, telepresence pioneer, and Duffie White, majority owner and CEO of TelePresence Tech, join forces to capitalize on the growing industry of customer services delivered through live video at the point of purchase. Telepresence Technologies LLC, "TPT", announced today the appointment of David Allen as the new Chairman of its Board of Directors. Mr. Allen brings both a financial investment in the company and a wealth of resources to TPT. As documented in Wikipedia, David Allen made history in the field of telepresence by co-founding the first commercially successful telepresence company in 1993. He shaped today's telepresence field by licensing his patent portfolio to HP, which became the first large company to embrace the telepresence industry. In 2007, he sold his telepresence company, Destiny Conferencing, to Polycom for $50 million. As a third entrepreneurial success in the telepresence industry, Mr. Allen and his team achieved innovations in the video managed services industry and sold his company, Iformata LLC, to AVI-SPL for an undisclosed sum in January, 2012. Today, David Allen is advancing from the $3 Billion telepresence field to transforming the $189 billion call center services industry from audio and data communication to a personal touch video communication experience. "Video is the most significant advancement in the evolution of human communication since the telephone. While corporate video communications can be adequate with the display of people from a remote location on flat screens, there are many business services where customers will not embrace the lack of a sense of presence", stated Mr. Allen. "Further, TPT's 3D solution does not require glasses, making for a more natural human experience." "This appointment brings together two pioneers in the telepresence field, and combines Dave Allen's experience as a successful entrepreneur with Duffie White's innovation and imagination," states Andrew W. Davis, Sr. Partner and co-founder of Wainhouse Research. 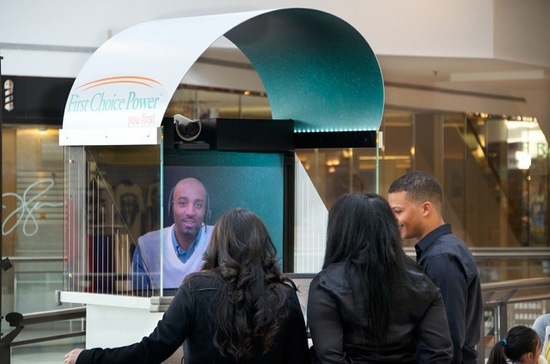 "The use of videoconferencing and telepresence to empower point of sale situations has the potential to reshape many retail environments while presenting enormous revenue opportunities for Telepresence Technologies." While most video providers are concentrating on the invisible back-end of communications through improvements in codec's, networks, software and cloud infrastructures, TPT is transforming the communication experience on the front end where customers' purchasing decisions and financial commitments are made. Even though video conferencing has improved in image quality with current HD telepresence systems, the customer experience with flat screens has not dramatically changed and these systems still have a lack of eye contact. This lack of eye to eye contact results in a "less than real" experience for the consumer. TPT has the patented technology to revolutionize the customer experience on a global scale. The technology developed by Duffie White and his team overcomes these limitations by achieving a more natural human communication experience, aligned eye contact and a true sense of depth. Rather than limiting the customer experience to a flat screen, TPT's 3D solution without glasses is bringing customer representatives to life to appear to be in the same virtual room with eye to eye contact. This customer endpoint location is critical for high quality customer service experience. "This is the missing link in effective distance communication", said Mr. White. He further commented, "This is the place where first impressions and decisions are made, which result in consumer financial commitments. And, it has far reaching appeal to all industries including finance, banking, healthcare, retail and recruiting." As an inventor, Mr. White has been granted five US patents and developed a portfolio of intellectual property covering advanced three dimensional communications solutions. Mr. White, founder and CEO of TPT, will continue to guide TPT's intellectual property portfolio development and remain responsible for the day to day activities. Mr. White commented "I am quite pleased and honored to have attracted one of the industry's most senior people to assist my company in its growth efforts. As we adjust our corporate direction from one as a high tech R&D effort to now deploying our 3D technology in today's marketplace, Mr. Allen is a welcomed asset in assisting the Company in these efforts. I have the greatest of respect for David Allen and believe he has the vision to transform customer service experience on a global scale." TPT designs, develops, manufactures, and deploys specialty 3D telepresence endpoints for its customers; some as a fixed product line and some as custom work for both specialty and vertical markets. TPT technologies serve customers in more than 25 countries globally. Telepresence Technologies LLC, \"TPT\", announced today the appointment of David Allen as the new Chairman of its Board of Directors. Mr. Allen brings both a financial investment in the company and a wealth of resources to TPT. As documented in Wikipedia, David Allen made history in the field of telepresence by co-founding the first commercially successful telepresence company in 1993. He shaped today's telepresence field by licensing his patent portfolio to HP, which became the first large company to embrace the telepresence industry. In 2007, he sold his telepresence company, Destiny Conferencing, to Polycom for \$50 million. Today, David Allen is advancing from the \$3 Billion telepresence field to transforming the \$189 billion call center services industry from audio and data communication to a personal touch video communication experience. \"Video is the most significant advancement in the evolution of human communication since the telephone. While corporate video communications can be adequate with the display of people from a remote location on flat screens, there are many business services where customers will not embrace the lack of a sense of presence\", stated Mr. Allen. \"Further, TPT's 3D solution does not require glasses, making for a more natural human experience.\"
\"This appointment brings together two pioneers in the telepresence field, and combines Dave Allen's experience as a successful entrepreneur with Duffie White's innovation and imagination,\" states Andrew W. Davis, Sr. Partner and co-founder of Wainhouse Research. \"The use of videoconferencing and telepresence to empower point of sale situations has the potential to reshape many retail environments while presenting enormous revenue opportunities for Telepresence Technologies.\"
While most video providers are concentrating on the invisible back-end of communications through improvements in codec's, networks, software and cloud infrastructures, TPT is transforming the communication experience on the front end where customers' purchasing decisions and financial commitments are made. Even though video conferencing has improved in image quality with current HD telepresence systems, the customer experience with flat screens has not dramatically changed and these systems still have a lack of eye contact. This lack of eye to eye contact results in a \"less than real\" experience for the consumer. \"This is the missing link in effective distance communication\", said Mr. White. He further commented, \"This is the place where first impressions and decisions are made, which result in consumer financial commitments. And, it has far reaching appeal to all industries including finance, banking, healthcare, retail and recruiting.\"
Mr. White commented \"I am quite pleased and honored to have attracted one of the industry's most senior people to assist my company in its growth efforts. As we adjust our corporate direction from one as a high tech R&D effort to now deploying our 3D technology in today's marketplace, Mr. Allen is a welcomed asset in assisting the Company in these efforts. I have the greatest of respect for David Allen and believe he has the vision to transform customer service experience on a global scale.\"